This felt wall hanging is a fun, fast and easy project to make for yourself or someone you love! Bring your tiny bits of precious lace, appliques and trims to create a hand sewn collaged tree. The lace tree can be embroidered and embellished with stitches, buttons and more. Class Requirements: You must know how to hand sew. You must know these embroidery stitches: straight and blanket before class. Date and time: Not currently on the schedule. Tidbits and Tats is my version of the popular “snip rolls”. This is a fun, fast and easy project to make for yourself or someone you love! Bring your tiny bits of precious lace, fabric, ribbon, appliques and trims to create a hand sewn collaged base. The lace base can be embroidered and embellished with buttons, sequins and charms. You can add in your own flare with other items such as fabric yo-yo’s and ribbonwork flowers. Class Requirements: You must know how to hand sew. You must know these embroidery stitches: straight, lazy daisy, French Knot and some bead embroidery stitches before class. Date and time: 2/hr. class not currently scheduled. This is a great technique project; I call it Metallic Threads 101, but it doesn’t stop there. In class you will make a “magic web” from bits of precious scraps, decorative yarns and metallic threads, sandwiched together with Solvy and machine stitching, lots of machine stitching. 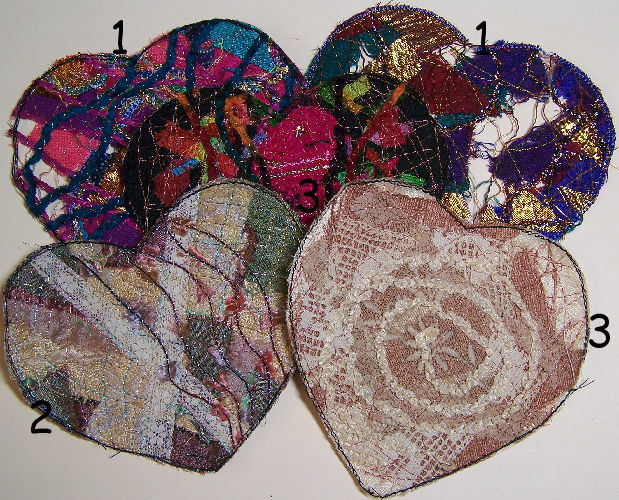 The unique fabric that you create will be used as a base for a heart shaped brooch that will be embellished with buttons and beads. Lesson 1: Making your “magic web” from precious bits of this and that. Keep in mind that you can create a larger piece of fabric, even a scarf with these techniques. 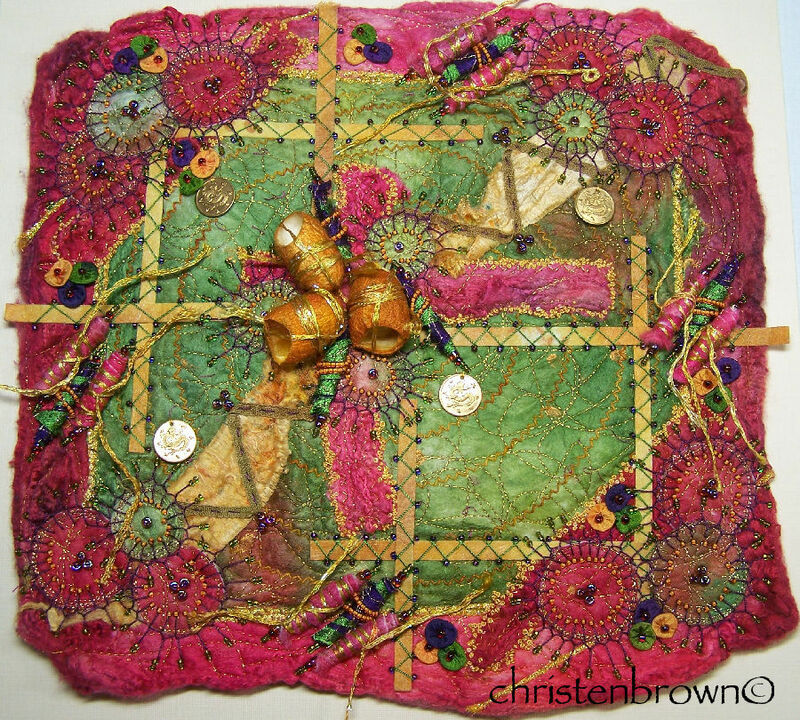 Lesson 2: Creating a base for the brooch from the machine-stitched “magic web” using bits of silk or cotton fabric. 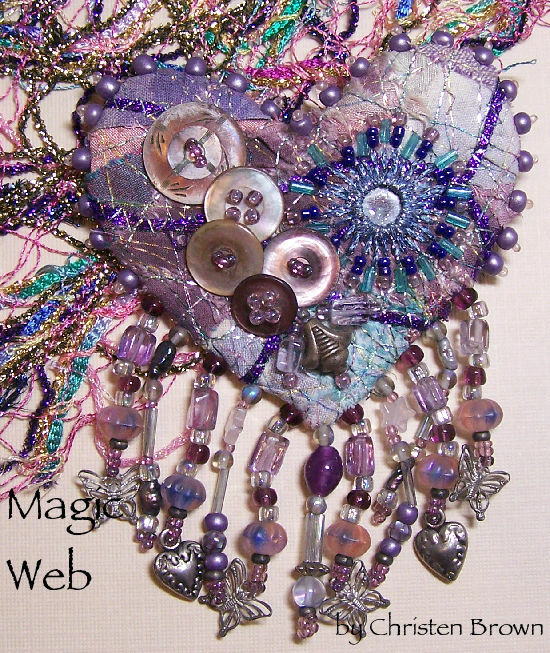 Choose from 2 different heart shapes, to create your brooch and embellish this with buttons and beads. In this class you will take a two silk painter’s hankies and turn them into a work of art! 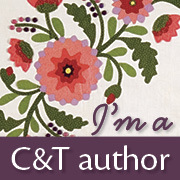 The hankies will be split, sandwiched, then machine stitched into a framed silk canvas base. This silken canvas will be embellished with a Painter’s Potpourri Pack full of threads, cocoons, a silk carrier rod and assorted threads. But the embellishments do not stop there! You will make your own beads and button shapes; and cut the pelmet Vilene into strips. These components will then be embroidered to the silk canvas with silk buttonhole twist. Directions will also be given to make silk ribbon pods and additional fabric beads. A few simple embroidered and beaded stitches will add that final touch, turning this unusual group of materials into a one of a kind Embellished Silk Treasure. Lesson 1: In this class you will take the silk hankies and create a canvas with a backing material and lots of machine stitching. One hanky will form the center of the canvas, and another will form the frame. Paint and the dyed yarns from the Painter’s Potpourri pack will be used to further embellish the surface of the canvas. Lesson 2: In this class you will cut the pelmet Vilene into strips or shapes; and make button rounds and fabric beads from the machine stitched hankies. Other embellishment options will be discussed along with the design of these components. Silk ribbon pods, with thread embellished beads and cocoons will help to complete the design. Lesson 3: In this class you will learn the embroidery stitches which include: straight, herringbone, Cretan, and colonial knot. These are used to attach the design components to the canvas. A few simple beaded stitches such as single, double, detail bead and long loops will be added to finish the design. Suggestions for backing the canvas will also be included. This lovely lace cuff is reminiscent of tranquil days lounging on an overstuffed satin pouf, or demurely sashaying along a tree-lined avenue, parasol in hand. 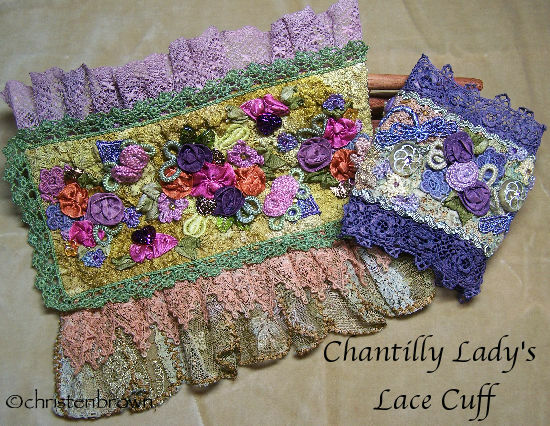 Two separate processes, one with Texture Magic, and the other with Solvy make the base of the cuff and the lace frill; pre-made lace will also be used. There are two styles to choose from that will be embellished with needle-tatted and crochet components, ribbonwork flowers, a few silk ribbon embroidery stitches, beads and buttons. The base can be left in the natural colors of the lace, or you can dye the components with the self-setting Colorhue dyes (no other dye will be covered). Please also note that basic crochet knowledge will be very helpful. Lesson 1: In this lesson you will explore working with Texture Magic, making the base of the bracelet with bits of lace enmeshed on the top. The next step is to take the Solvy and small amounts of lace turning them into a lacey trim for the cuff. Lesson 2. In this lesson you will dye the base, lace frill, any extra lace trims and appliqués along with the perle cotton and ribbons. Lesson 3: In this lesson you will be making the floral components. Directions for beginning needle tatting with four basic stitches; two basic crochet flowers will be included, it is recommended that you have crochet experience. Directions for four ribbonwork flowers round out the floral components. Lesson 4. In this lesson the floral components and appliqués will be assembled onto the base, adding in a few silk ribbon embroidery stitches. Embellishments will also include a few beads and buttons. Directions will be provided for assembling the base cuff and lace frills. The prompt over at The Three Muses was OH Man, and I chose a shortened version of the prompt. Billy AKA “Yukon Jack” and his trusty steed “Bingo were the BMOTB (Big Men on the Block), 100 proof, all boy and all horse! My collage started with this lovely image of a happy little boy on a pony, I added in bingo paper, image of a ruler, image of text, art papers, acrylic paints, and some bits of paper from a bottle of whiskey. The prompt over at Collage Obsession was this beautiful brick staircase. I added in a fairy from Dover Images, copies of art paper, newsprint, and an image of John Lennon that is painted on a building by my house which I have digitally manipulated.